Straightening your teeth has never been easier and more worry-free than using ClearCorrect. This amazing modern orthodontic service utilized by Dr. Dervin provides invisible braces for Shawnee KS residents, straightening smiles without the unattractive metal-mouth appearance associated with traditional braces. 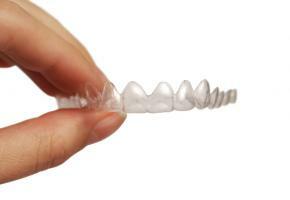 How does the life-changing technology of ClearCorrect actually straighten teeth? It involves just a few simple yet vital steps. Dr. Dervin will meet with you, talk about your concerns and goals you have with your teeth, and then evaluate if ClearCorrect in right for you. Then he will take impressions, photos and x-rays of your teeth and this information will be used to determine the best way to employ the straightening process. Using the latest in digital mapping and molding technology, an exact 3D model of your teeth is created, and then a complete treatment plan of gradually adjusting and straightening your teeth is mapped out using ClearCorrect braces. These invisible braces are actually a series of clear, custom, plastic aligner trays that are simply worn over the teeth. These aligner trays look similar to those used for teeth whitening. Each aligner tray set is manufactured slightly different from the next one as each aligner moves your teeth a little bit at a time, until you eventually end up with straight teeth and an amazing smile. Unlike traditional braces, there are no wires or brackets to tighten and the aligner trays are easily removable when eating food, or while brushing and flossing. Best of all, this amazing procedure will give you the smile you desire with the majority of people completely unaware that you are getting your teeth straightened. Are your teeth in need of straightening? Consider the high-tech option that Dr. Dervin provides with ClearCorrect. These life-changing invisible braces offered to Shawnee KS residents are exactly what you and your smile have been looking for.